Sedgman’s latest claim against Heron Resources over a contract at the Woodlawn project has been met with another rejection due to a violation of a guaranteed maximum price (GMP) framework, according to the base metals developer. The CIMIC Group’s subsidiary has lifted its $49.9 million claim in February this year to $53 million for its works at Heron’s zinc-copper project in New South Wales. The contract superintendent has approved only new variations for work recently requested by Heron, totalling $76,082, as per the formal contract provisions. The superintendent has rejected the remainder of Sedgman’s progress claim. The engineering, procurement and construction (EPC) contract was expected to generate revenue to Sedgman of around $107 million over 18 months. Heron has previously argued that the $49.9 million claim placed the 18-month contract above its GMP of $109 million. “The company remains extremely disappointed in the actions of Sedgman in attempting to circumvent the fundamental principle of the contract entered into to give project cost certainty under a guaranteed maximum price contract framework,” Heron said in an ASX statement. Heron continues to hold $10.8 million in bank guarantees from Sedgman, and puts the contractor up for liquidated damages as a result of its delayed delivery schedule. Sedgman advised Heron at the start of March that the anticipated date for first ore to be fed to the process plant at the Woodlawn project would be delayed, according to Heron. The miner now expects ore processing to start early in the second quarter of this year, with first concentrates ready for shipment in May. Sedgman reported the project as being 98 per cent complete at the end of February and commissioning at 63 per cent. Site construction activity has reduced and workforce numbers have followed accordingly, with Sedgman’s personnel progressing Woodlawn through the wet commissioning stage, to be followed by ore commissioning, ramp-up and performance testing. “Heron has been very committed to delivering on dates at every milestone of the Woodlawn project development,” Heron managing director Wayne Taylor said. 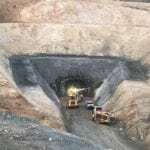 Woodlawn achieved first underground production from the mine last week, with monthly development meterage steadily ramping up since the start of operations in September last year and now exceeding budget levels.